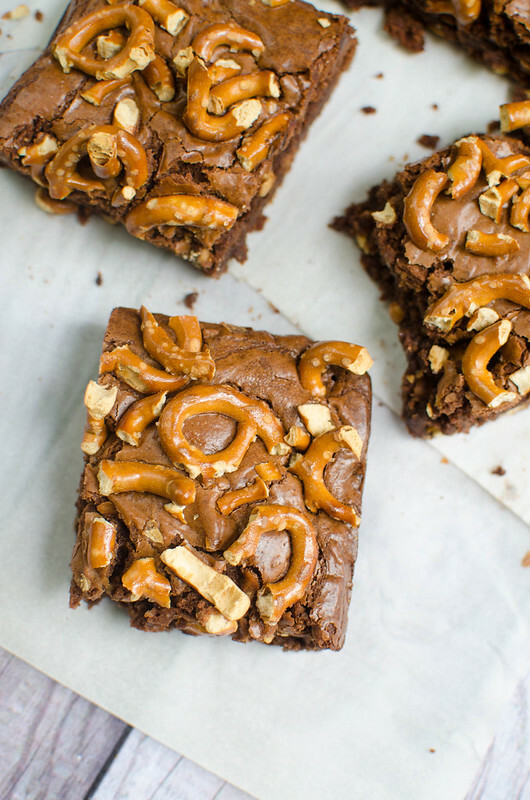 Peanut Butter Pretzel Brownies are perfect for all of your sweet and salty cravings! 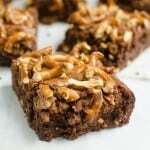 Rich brownies with crunchy peanut butter and chopped pretzels on top! Can I complain about the weather? I know, totally shocking that I’m not satisfied with the weather in Texas, right? But y’all, all of Fort Hood has been flooded this week and it’s ruining my life. It took me an hour to find my way home the other night because all the roads to my neighborhood had rivers flowing over them or were already blocked by cops. And it was midnight and my poor babysitter was stuck at my house and all I wanted to do was eat nachos in bed while rewatching last week’s Survivor. I needed brownies in my life the other day. I was literally having the worst day of my life. I cried on the phone with a couple people, I cried in my car, I cried sending an email. I was a mess. 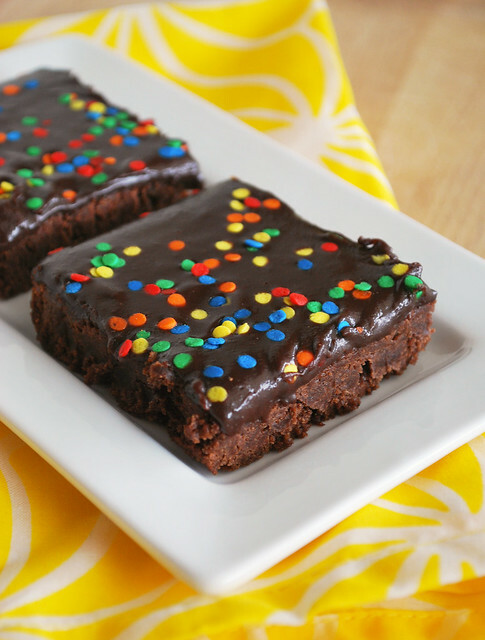 So, you know, brownies are generally my answer for days like that. But why do boring brownies when you can fill them with crunchy peanut butter and top them with crushed pretzels? 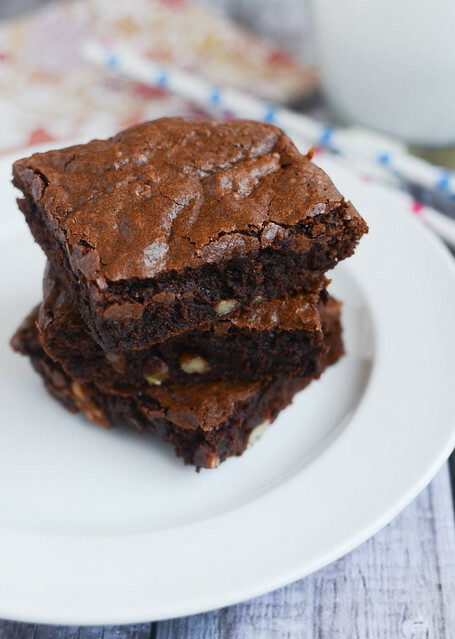 You guys know that if sweet and salty is an option, I’m going for it so these are probably my most favorite brownies ever. Make them. Hide them from the people you live with. I will not judge you. Preheat oven to 350F. Line an 8x8-inch baking pan with parchment paper. Melt butter over medium heat, remove from heat, and stir in chocolate. Stir until everything is melted and smooth. Set aside to cool. In a large mixing bowl, stir together granulated sugar, brown sugar, eggs, vanilla, and peanut butter. Stir in cooled chocolate mixture. Add flour and salt and stir until just combined. Pour batter into prepared pan and sprinkle with chopped pretzels. Bake 55 - 60 minutes or until a toothpick inserted into the center comes out mostly clean. 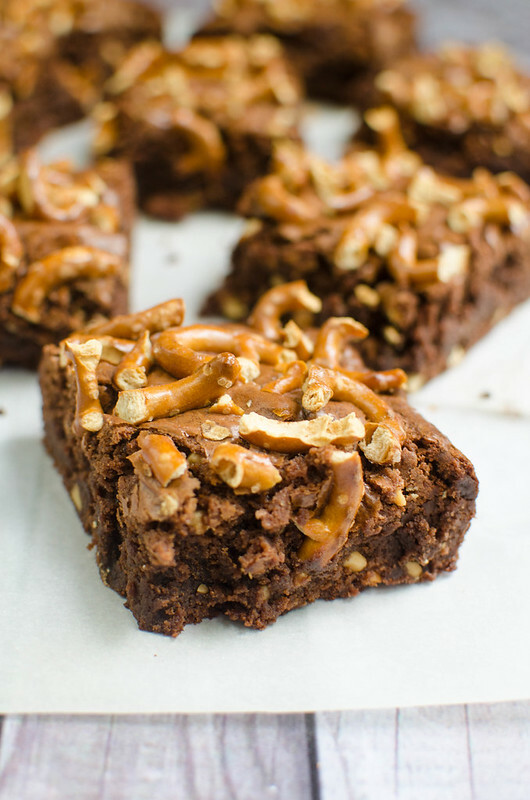 4 Responses to "Peanut Butter Pretzel Brownies"
My Friday could use one of these brownies! Love the sweet and salty combo! Hi! 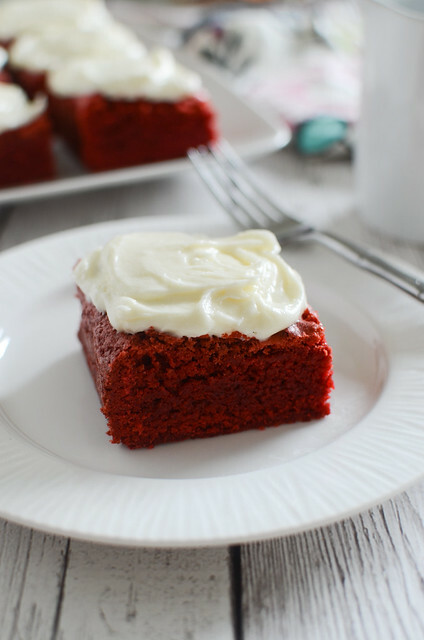 This looks great✨ But how much flour did you add on the recipe? Thank you❤️ I like to give it a try. Oh my gosh, I can’t believe I forgot to add that in! It should be 3/4 cup flour. Thanks for catching that!